METRO 0 series of fixed gallonage nozzles with 7 flow and pressure choices. Delivered with the 95 gpm @ 100 psi (380 l/min @ 7 bar) calibrated flow disc installed. 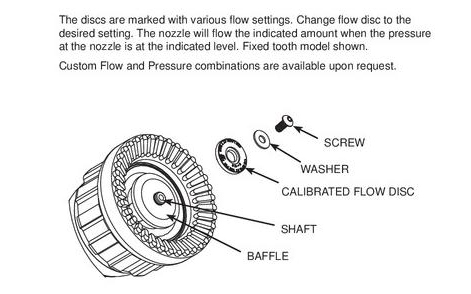 METRO 0 NOZZLE 1" NH (25mm) Fixed gallonage nozzle with 7 flow and pressure choices. Includes flush without shutting down, patented slide-type valve for turbulence-free flow control, six detent flow positions, and "Gasket Grabber" inlet screen. Lightweight hardcoat anodized aluminum for maximum resistance to corrosion and wear. 1" NH (25mm) full-time swivel knurled coupling is standard. METRO 0 W/GRIP1" NH (25mm) Fixed gallonage nozzle with 7 flow and pressure choices. Includes flush without shutting down, patented slide-type valve for turbulence-free flow control, six detent flow positions, and "Gasket Grabber" inlet screen. Lightweight hardcoat anodized aluminum for maximum resistance to corrosion and wear. Pistol grip is mounted below the valve. 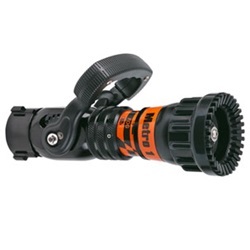 1" NH (25mm) full-time swivel knurled coupling is standard. 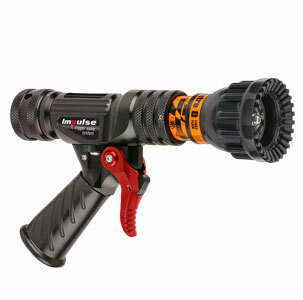 METRO 0 WITH IMPULSE TRIGGER VALVE SYSTEM 1" NH (25mm) Fixed gallonage nozzle with 4 flow choices. Includes flush without shutting down, trigger operated slide valve for turbulence-free flow control, and "Gasket Grabber" inlet screen. Lightweight hardcoat anodized aluminum for maximum resistance to corrosion and wear. Pistol grip is mounted below the valve. 1" NH (25mm) full-time swivel knurled coupling is standard.